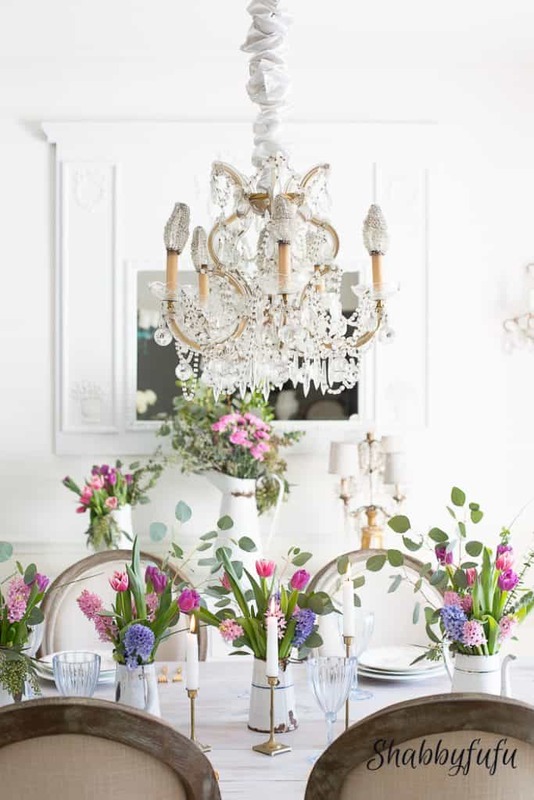 Just because your room is all white doesn’t mean that you can’t achieve a spring look! You just have to know how to make it happen! 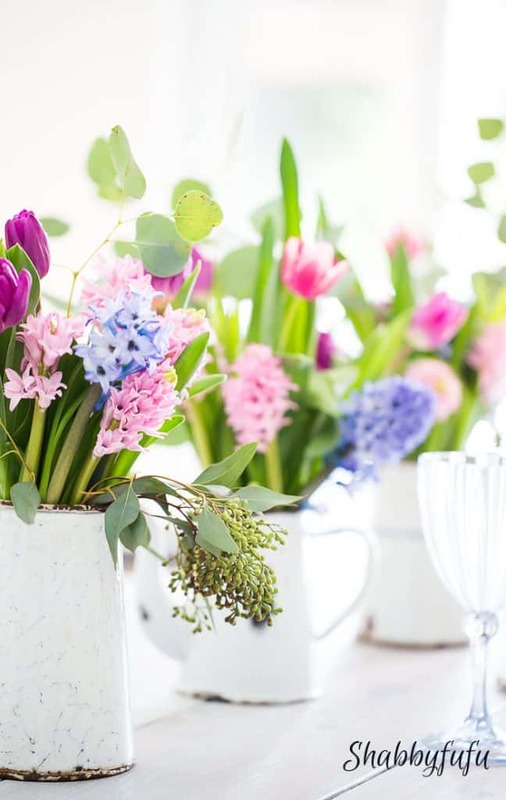 The season of spring often means color in the world of decorating and design. But it’s a conundrum for me, as I decorate in mostly white on white in our Miami home! This is where the flowers come into play! Beautiful flowers that maybe one doesn’t see as much of in other seasons and are reserved by nature for the most glorious season of rebirth and bloom. Just that one simple addition can help any room to achieve a spring look. 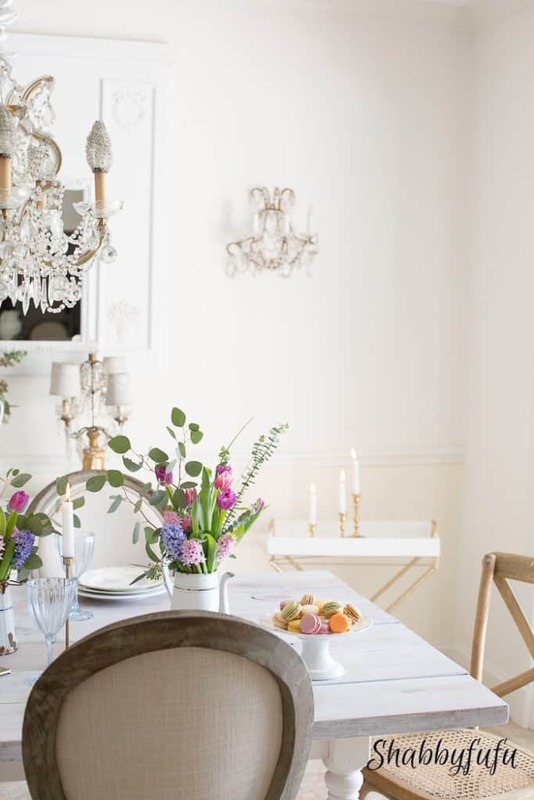 Today I’m sharing my dining room set for a spring brunch in the Styled For Spring Home Tour hosted by my sweet friends Randi from Randi Garrett Design and Jen from Decor Gold Designs. If you are coming here from either of their posts and are new to my blog, I welcome you in and hope that you’ll sign up for the mailing list below if you like what you see! Let’s get started with my tour! 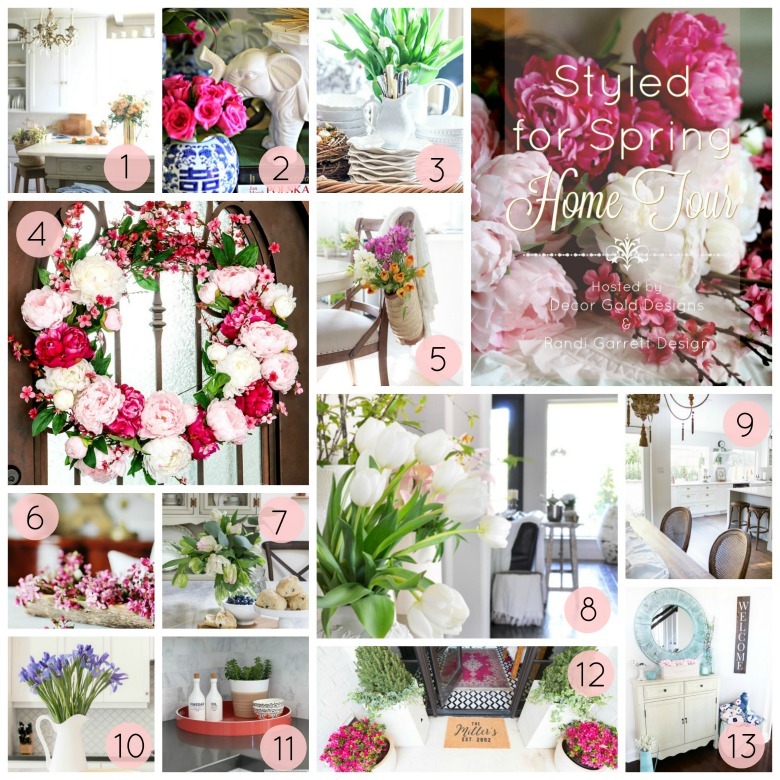 I’m excited to show you how to decorate for Spring! 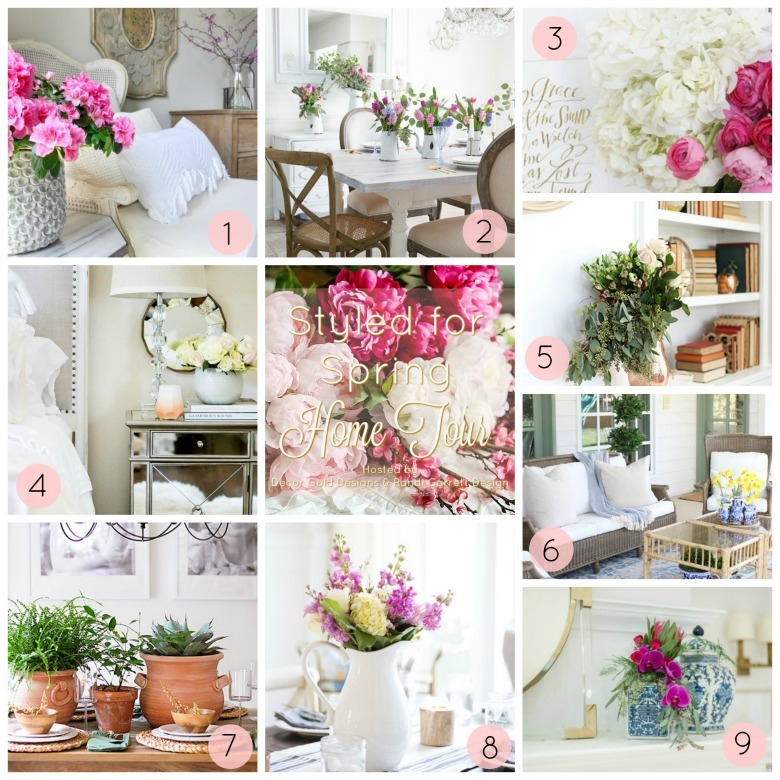 Color palette is important to me and since I have such a neutral home my tint muse comes from florals. I love using pieces that you might not necessarily think of for flowers, like these French enamelware pieces that I brought home from a buying trip to France (when I was still doing that). They are 100 years old and have some patina (rust, lol!) so to avoid destroying my table surface I have a small jelly jar set in each one to hold the flowers and water. You could use FAUX FLOWERS to avoid that mess and I’ve linked (affiliate links have been used in this post) some of my favorites below. My style is decidedly leaning towards ROMANTIC FRENCH MODERN. 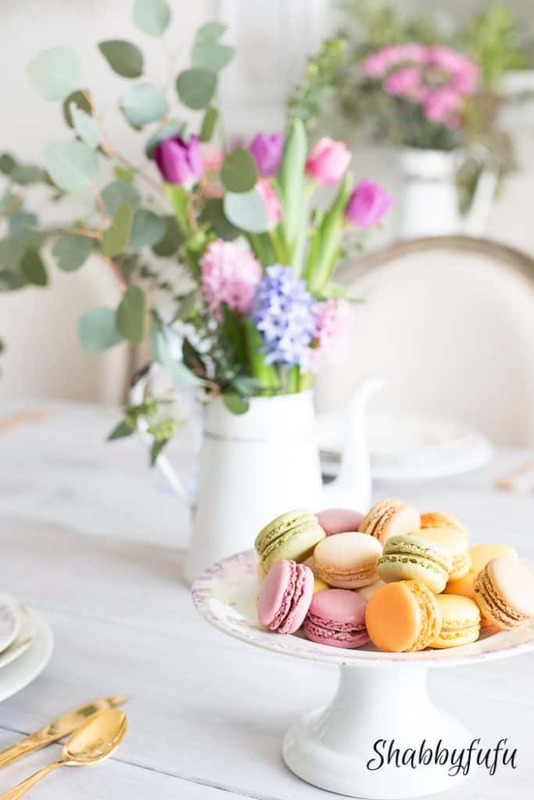 In setting my brunch table I made sure to have plenty of Macarons on hand. There was a time when you could only source MACARONS by perusing the patisseries of Paris. Now you can find them at almost any specialty grocer these days. Did you know that Trader Joes carries macarons? Like everything else that they sell, the price is unbeatable and the taste is as delicious as these look! They compliment the colors of my Spring Flower Arrangements and would be stunning on an Easter decorations table too! The pale washed dining room table is one that we made ourselves. (yes, we are like that:-) Recently, I showed you How To Whitewash A Table and I’m so glad that I finally took the plunge with that project. The dinner plates are antique French ironstone and impossible to find. I’m so glad that I have them on hand. 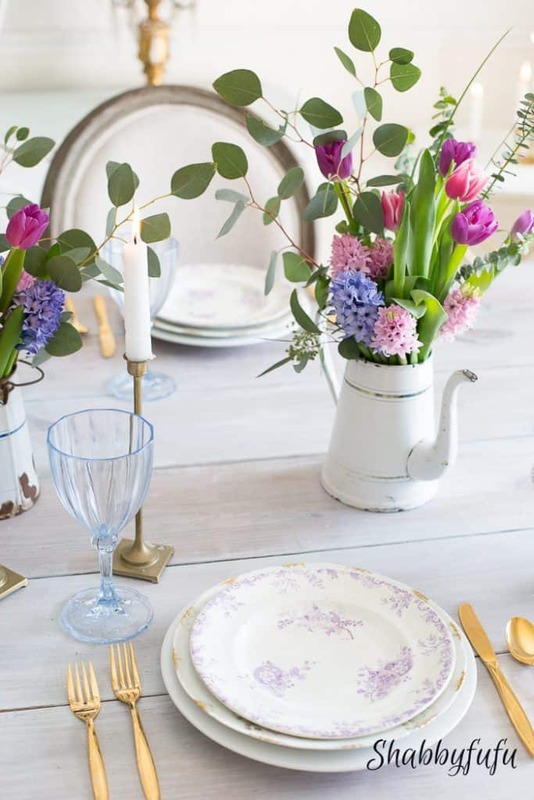 I mix and match my everyday plates with my antiques and fine china and love to layer plates to give depth to a table setting. If you have a variety of plates or love to shop flea markets and thrifts then just go for it and combine them all. In my book of table setting rules, there are no rules! 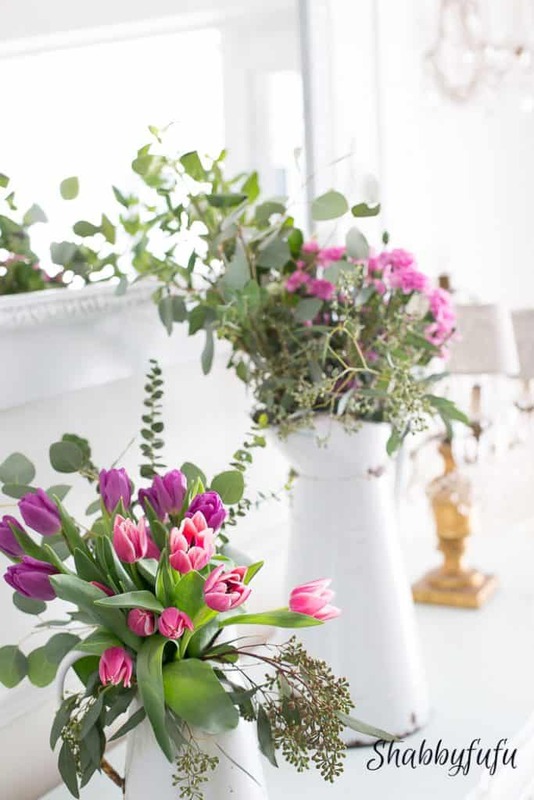 Don’t these flowers just bring in the look of Spring immediately? 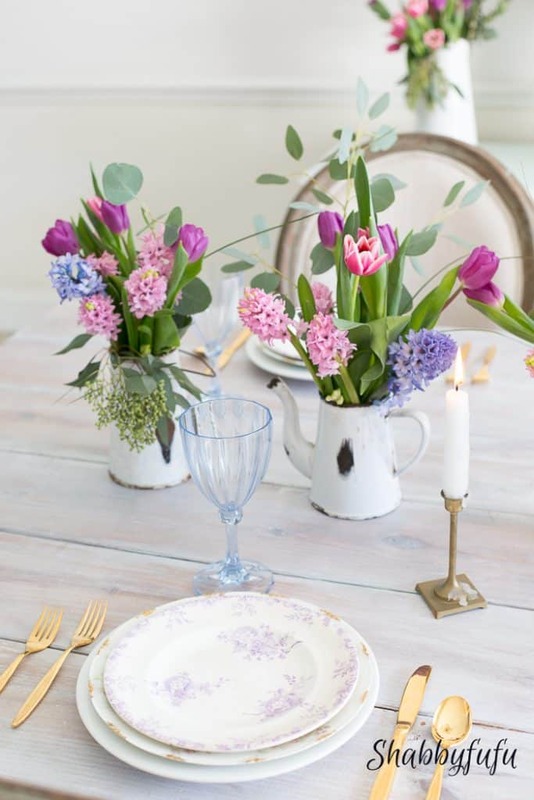 It’s all about mixing and mingling the colors of whatever seasonal or silk florals you can find for your spring centerpiece and set against a white background. 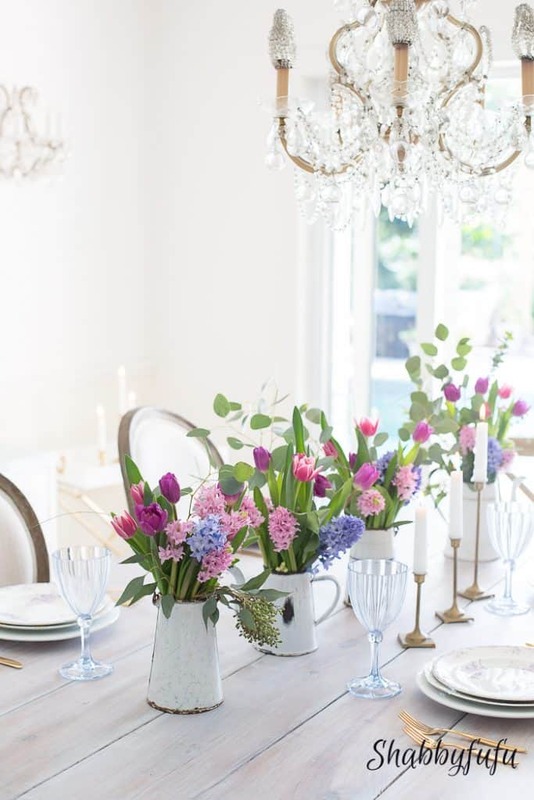 A naked table or a tablecloth in white will do and the colors of spring…pink, aqua, and lavender. 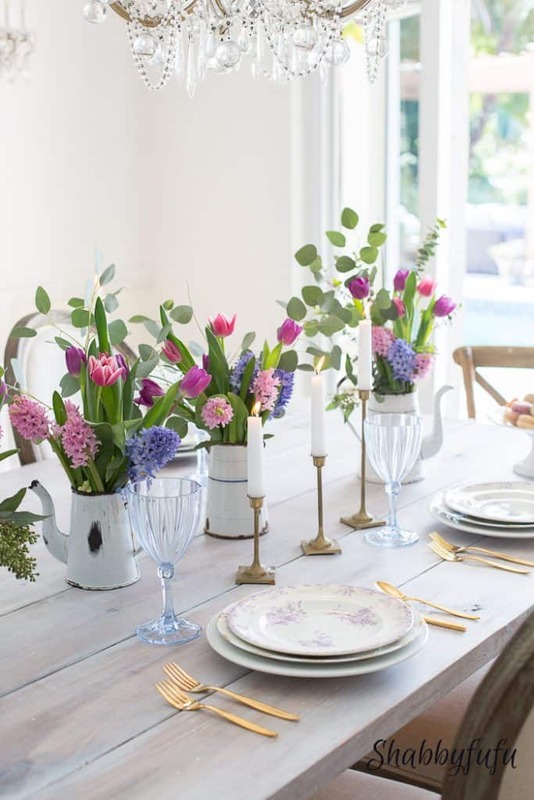 Simplicity meets color is such a fun way to combine for the decoration of Spring. Could these spring flowers be any more vibrant? If you can find beautiful flowers and finds like these, you’ll have no trouble achieving the look of Spring. 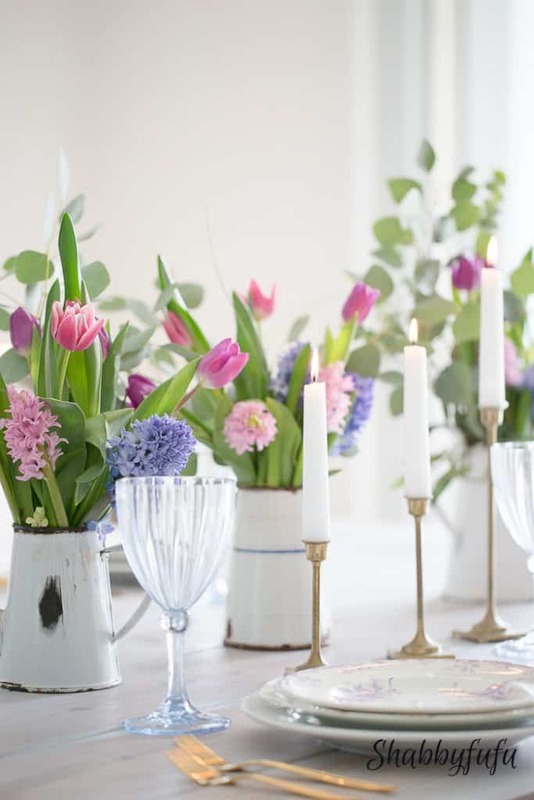 I hope that I’ve inspired you to add some SPRING COLOR to your dining room and home with FLOWERS! Next on the tour is my friends Rachel from Maison de Pax and I’d love to have you visit the rest of the ladies in today’s tour as well!